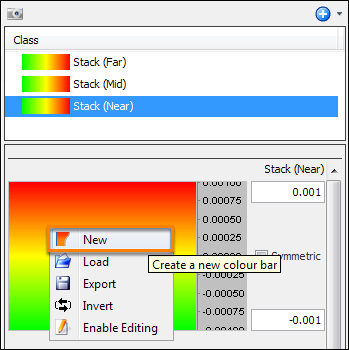 In the tree, select the class which you want to create a new colourbar. Right-click the colourbar in the Details Panel and click New. You will see a black-and-white gradient colourbar. This colourbar can be edited based on your preferred choice of colours to create a custom colourbar. See Editing a Colourbar for more details.